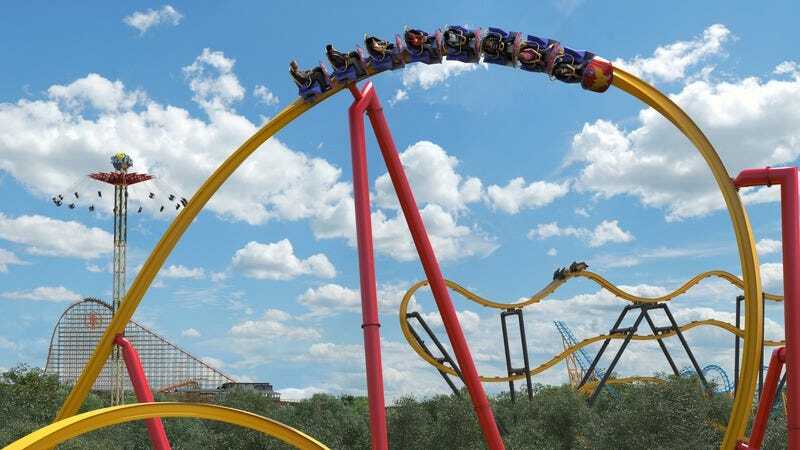 Six Flags has announced a brand new Wonder Woman roller coaster that’s set to debut next spring at its Texas Fiesta park in San Antonio. As revealed in USA Today, the ride, called the Golden Lasso, will sport an unusual style of coaster engineering where the train runs on a single 15.5-inch-wide track, rather than your usual set of two rails. Six Flags’ chief corporate engineer, Larry Chickola, claims the single-rail design ensures the coaster runs more smoothly than dual-railers since there’s no chance of the two sides becoming misaligned and causing bumpiness. It also doesn’t have the typical supports you might be used to seeing on a coaster, and its bizarre assemblage of beams and ropey track leave it looking like a surreal McDonald’s-themed modern-art trill ride. “It’s just going to look wrong, but in a nice way,” Jeffrey Siebert, president of Fiesta Texas, told USA Today. The Golden Lasso will start with a 113-foot climb and 100-foot drop at 90 degrees. Hitting a top speed of 52 mph, riders will “feel like they’re riding Wonder Woman’s whip” as they fly through three inversions, including a move called the “180-degree stall” where the train turns half-way over and leaves riders hanging for a few seconds before finishing its roll. And if that weren’t terrifying enough, the tiny rail that’s the only thing holding you up runs underneath the train, so if you lean over at any point (when you’re not upside down, of course), you’ll just see straight down to the ground.